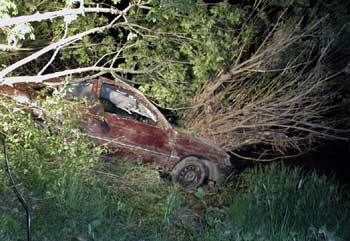 In the night from 05/08 to 05/09/2004 at 02:08 a m First Responder Nittenau and VFD Bergham were dispatched to a severe mva on highway ST 2149. A car with five passengers had crashed against a guard rail and torn it from its staying. The passengers were only slightly injured. Another car was catapulted over the guard rail and crashed against a tree at the foot of an 8 metres high slope, about 1 meter away from the river Regen. The two seriously injured passernegrs could leave the wrecked car by themselves, but said that none of them had driven the car and they wouldn't know where the driver was. Thus, at 02:27 a m the VFD Nittenau was alarmed for floodlighting the scene and searching for the missing driver. Floodlights were set up and further personnel was alarmed, because the person could not be found. From the neighbour county of Cham, the fire departments Reichenbach, Walderbach and Roding came to the scene. Water-rescue units from Burglengenfeld, Teublitz, Schwandorf, Nabburg and Pfreimd also were present. Two emergency doctors and several Red Cross units were alarmed. And the police supported with a dog unit and a helicopter with thermal imaging camera. 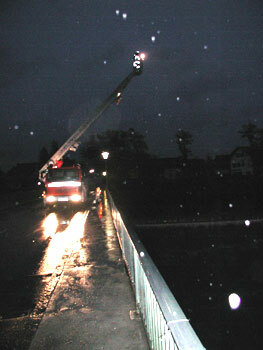 The river Regen was lighted by the VFD Nittenau ladder, because it had to be assumed that the missing person might have been floating downstream. All in all about 120 people were involved in the search for the missing driver. At about 05:30 the search was stopped without success. At that time, police finally assumed that there never had been a missing driver and that one of the two passengers had driven the car but didn't want to admit that. 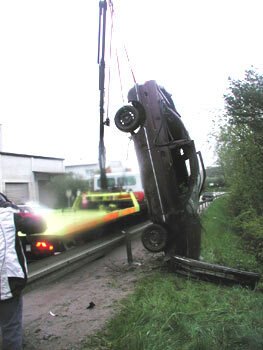 The wrecked car was recovered at about 06:30 a m.